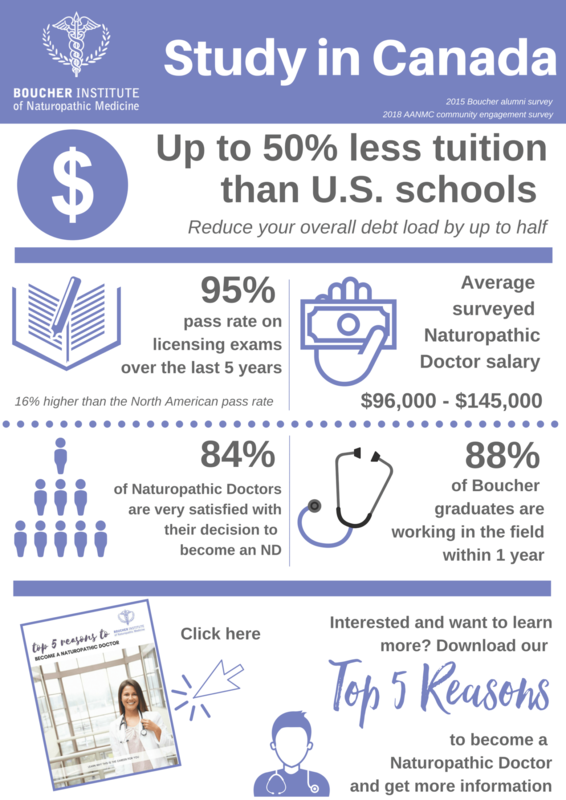 To learn more about our program, people, and admissions requirements, grab our Top 5 Reasons to Become a Naturopathic Doctor. The Boucher Institute of Naturopathic Medicine is Western Canada’s only accredited naturopathic medical school. Our students choose the Boucher Institute for a variety of reasons. British Columbia is known for its stunning natural beauty – with towering mountains, forests and beaches. There is also no shortage of activities for the outdoor enthusiast, with nearby skiing, hiking, mountain biking trails, rivers, lakes and, of course, the Pacific Ocean. The mighty Fraser River is minutes from the school, with a beautiful boardwalk extending a few miles through New Westminster. We offer a cohort model of education with class sizes of approximately 30 students (never more than 36). This type of learning model uses the power of interpersonal relationships (student to student and student to instructor) to enhance the learning process and provide additional support to the cohort members as they move together toward program completion. Our small class sizes allow for a collaborative and intimate learning environment, an outstanding student to instructor ratio and a close-knit community. Our academic philosophy, demonstrated through our careful curriculum design, incorporates principles of research-based learning theory, conventional academic wisdom and creativity within a mentorship-like context. How do we know our unique academic philosophy works? Our students consistently perform above the average of other CNME-accredited and candidate schools on the Naturopathic Physicians Licensing Exams (NPLEX). We are committed to attracting and keeping the best faculty. Courses are taught by instructors with a terminal degree in their subject area (i.e., PhD, ND or other fully-qualified healthcare professional). Clinical expertise qualifies these professionals to present and demonstrate the specific knowledge and skills required. Clinical practice and integration courses are taught exclusively by licensed, practicing naturopathic physicians. Our academic philosophy strives to incorporate principles of proven conventional academic wisdom and a mentorship program. There are no electives at the Boucher Institute, which ensures our graduates are equally strong in all standard naturopathic modalities. Unlike other schools, we offer Traditional Asian Medicine as part of the curriculum, which means our students are eligible to practice acupuncture upon graduation. Our biomedicine course, which offers the basic sciences as one integrative course, is unique to the Boucher Institute. As a synthesis of several fields of study, biomedicine promotes an integrative, holistic and clinically relevant view of the basic sciences. The instructor ratio in clinical education ranges from four to eight students per supervising naturopathic doctor. We have over 20 clinical instructors, all of whom maintain private practices in addition to teaching at the Boucher Naturopathic Medical Clinic. This means clinical instructors are current in the field and bring their own areas of expertise to the clinic. Along with direct patient care, students get practical training as assistants in the dispensary, laboratory and at the front desk. We recognize that no patient will benefit from the care of a good naturopathic physician unless that physician is able to successfully practice medicine. We also recognize that students entering the profession may need help with the practical aspects of entering into naturopathic practice. That’s why we have developed a comprehensive professional development program that is offered throughout your four years of study. Opportunities abound for students who wish to get immersed in life outside the classroom. Join our peer support team, unwind in a yoga class, or get to know our sports medicine club. Whatever your interests, chances are there is a group for you.